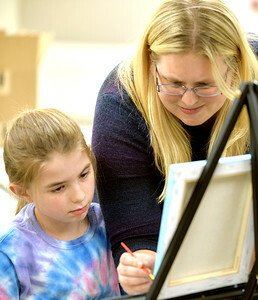 Mary Beth Nolan - for Shaw Media Troop 978 leader Jessica Scholfield helps daughter Savannah with her painting during a troop meeting Thursday February 4, 2016. 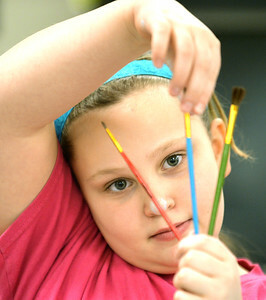 Mary Beth Nolan - For Shaw Media Mahala Englehart picks a brush while working on a painting badge with her Junior Girl Scout Troop 978 during a troop meeting Thursday February 4, 2016. 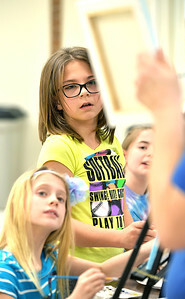 Mary Beth Nolan - For Shaw Media Troop 978 Junior Scouts Ella Logue, from left, Tessa Hober, and Savannah Scholfield listen to instruction while working on a pairing badge during a troop meeting Thursday February 4, 2016. 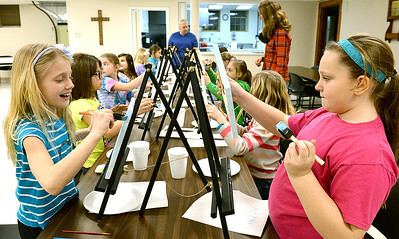 Mary Beth Nolan - For Shaw Media Ella Logue, left, and Mahala Englehart of Junior Girl Scout Troop 978 paint backgrounds on their canvases during a troop meeting Thursday February 4, 2016 at the Marengo United Methodist Church. 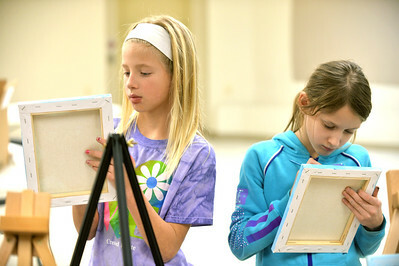 Mary Beth Nolan - For Shaw Media Junior Girl Scouts Rachel Grismer, left, and Alexandra Conroy add details to their owl paintings during a troop meeting of Troop 978 Thursday February 4, 2016. 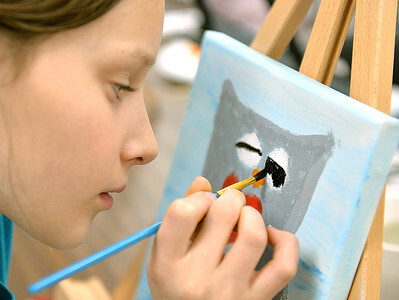 Mary Beth Nolan - For Shaw Media Junior Girl Scout Samantha Conroy add details to her owl painting during a troop meeting of Troop 978 Thursday February 4, 2016. Junior Girl Scout Samantha Conroy add details to her owl painting during a troop meeting of Troop 978 Thursday February 4, 2016.